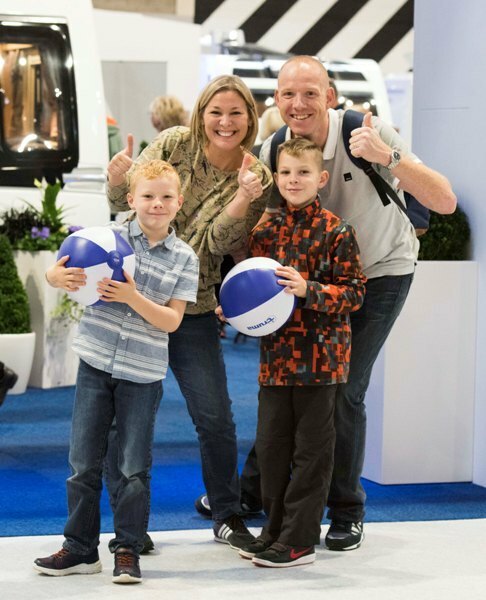 More than 700 motorhomes, campervans, tourers, holiday homes and trailer tents will be on show at the UK's largest leisure vehicle event, the Motorhome and Caravan Show 2018, at Birmingham NEC from October 16 to 21. Among the highlights will be brand new Morelo Palace motorhome (pictured above), although those willing to meet the £270,000 asking price will have to wait until October 2019 for delivery as it will be built to individual specifications. 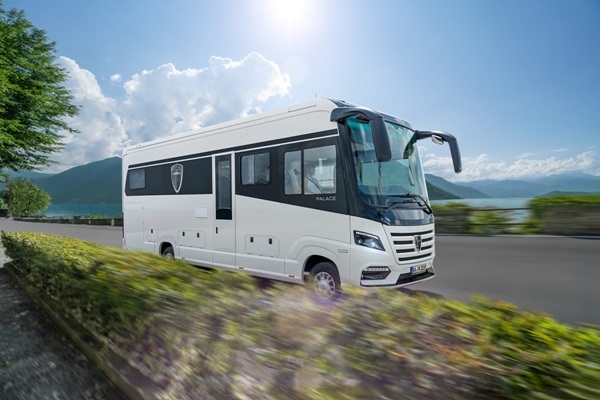 Arriving in the UK just in time for the Motorhome and Caravan Show, the German-built Morelo Palace boasts a panoramic front windscreen with 'intelligent glass' that darkens the cab windows for privacy when parked. There are two luxury bedrooms with queen-sized beds and a further electronically-controlled fold-out bed in the luxurious living area. Along with a bathroom, featuring an oriental shower, a fitted kitchen includes copious integrated storage and every domestic appliance. 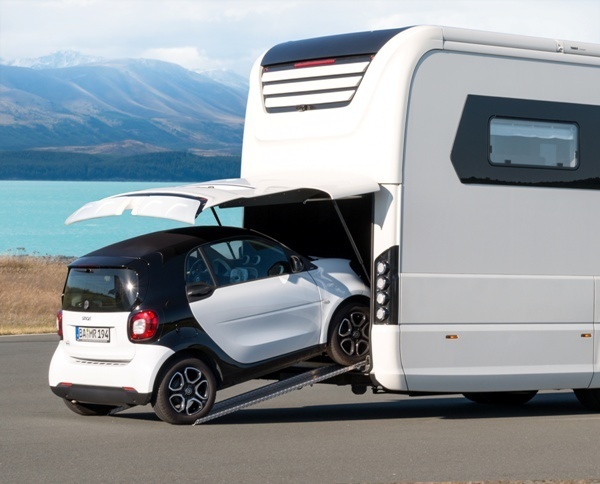 An integral garage even allows for a car to be parked inside (below), or the vehicle can tow a further 3.5 tonnes if additional cars, boats or tourers are required. The show also features exhibitors offering information and advice on holiday destinations and tours across the world. Visitors can enjoy live cooking demonstrations, relax in the new Woodland Trust Wellbeing Rest Area, and enjoy free attractions such as Motorhome Manoeuvring, Towing Tuition and the ever-popular Campervan Test Drive. 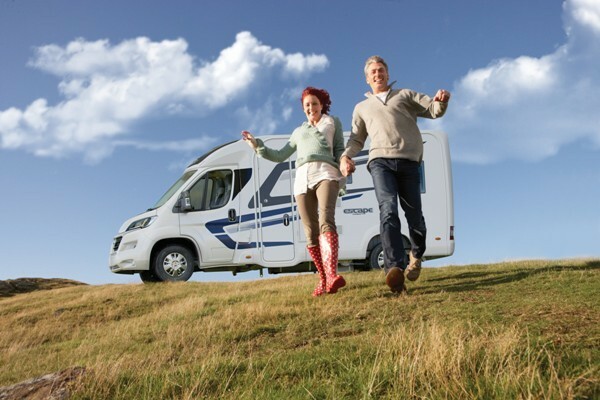 New products will be showcased on the LIVE Theatre stage, which will also host celebrity appearances for the likes of architect and TV presenter George Clarke, who opens the show on October 16, and television's Dr Hilary Jones extolling the mental and physical health benefits of leisure vehicle holidays. Swimming star Sharron Davies will speak about her motorhome adventures on October 18, while TV presenter Matt Allwright will recount his favourite touring experiences on October 16. Mountain climber Bonita Norris will talk about her Everest expeditions on October 20 and TV doctor Dawn Harper will discuss the benefits of outdoor life on October 16. Guest chefs, including barbecue enthusiast Richard Holden and Caravan Cookbook author Monica Rivron, will be cooking up some tasty meals. Show tickets start £8.50, with free entry for children aged 15 and under, and parking included in the ticket price. Cost: £8.50 (over 60s), £9.50 adult when booking before October 15, after which time prices revert to the on-the-door price of £12 Senior and £13 Adult. A £1.25 transaction fee applies. Accompanied children under 15 free.